The Copeland-Roach Motor Company was established in our city in 1908. At that time the company bought the old city hall and fire engine house on First Street from the city. They immediately reconstructed and built a new addition on the north side of this structure. The building is a two story double brick; the upper part is nicely arranged for their office rooms, and the entire lower space is occupied for the garage salesroom, auto livery and repairing department, where there are none employed but skilled and experience mechanics. Special attention is given to tourists and free air is furnished for their motor tires. 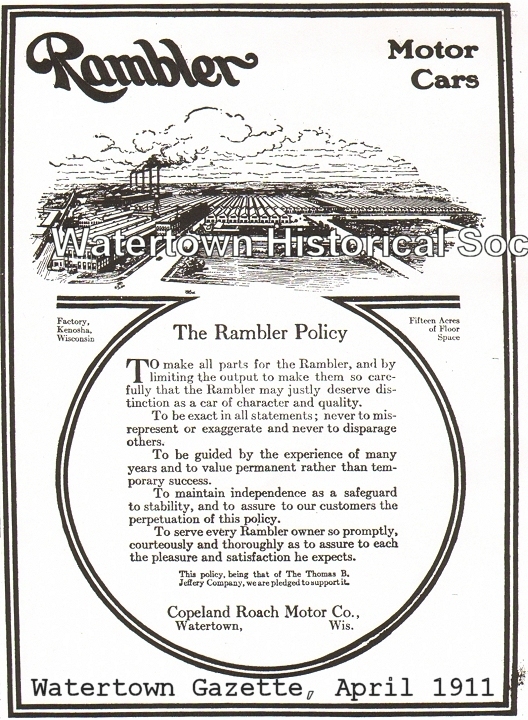 The Copeland Roach Motor Company was incorporated in 1908 with T. B. Roach, president; W. R. Roach, vice-president; W. F. Copeland secretary and treasurer. T. B. Roach has just bought W. F. Copeland's entire stock in the company. Few people ever stop to realize the importance or magnitude of the automobile industry in this country. 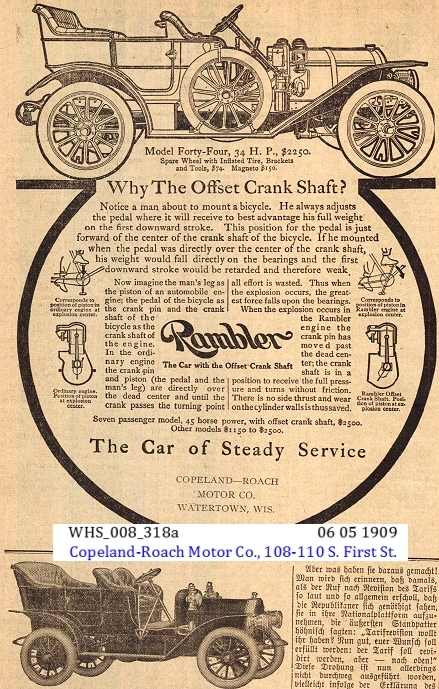 No branch of business has made more rapid strides in recent years and no more convincing proof is to be found than by a visit to the garage and salesroom of the Copeland-Roach Motor Company, which is centrally located at 108 and 110 First Street. Here you will find such well-known automobiles as the Rambler, Cadillac, Mitchell and Reo. These cars are all high-grade machines and the equipments are of the latest contrivances of 1912. The Rambler cross-country is one of their great sellers this season, which is a large elegant car, and no one that has seen it will guess its price below $2500 or $3000. 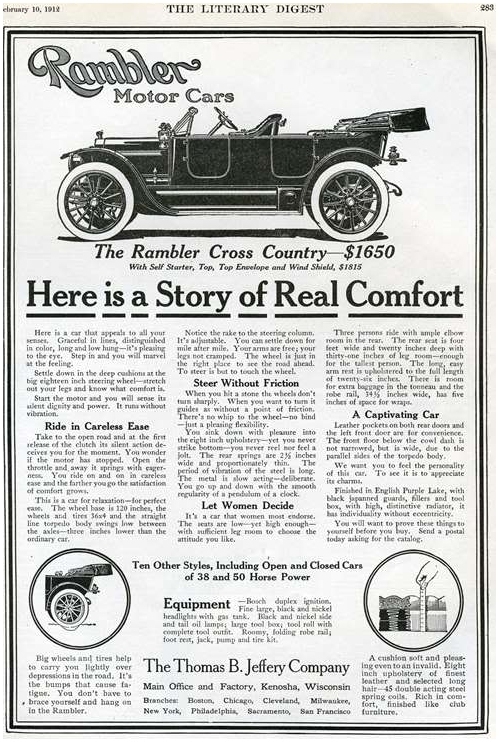 The Rambler Co. was the first to offer a real bicycle for less than $100 and they are the first in the field now offering a real car for less than $2000. The Rambler cross-country price is $1650.00. The other cars that are handled by the company are all of the modern construction and for workmanship and material no better cars can be found in this or any other country for the money. "Theodore B. Roach (T. B.) was born 20 May 1867 in Milford, Jefferson, Wisconsin, the son of James Byron and Sarah "Sally" Perry (Bemis) Roach. As this article mentions, he was President of the Copeland Roach Motor Company. Vice president of the company, his older brother William Ross Roach (W. R.), was born 23 February 1860, also in Milford. William's obituary describes him as, "one of the leading businessmen in Waterloo."